Pulps were entertainment for the American masses of the middle 20th century. The masses of other countries and other times also needed their cheap thrills. A very popular form of such in Japan in the 19th century was the woodblock print, which by then had had a long and glorious history dating back to it’s inception in the early 1700s. There had been many masters of the woodblock down through the centuries. The last of them was Tsukioka Yoshitoshi, and he is my favorite woodblock artist of them all. 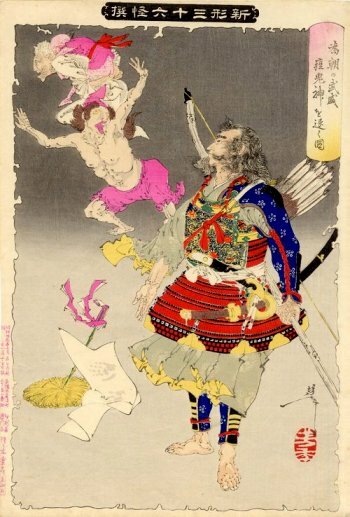 Yoshitoshi’s career began when Japan’s feudal society was crumbling as they moved into their western-influenced modern period. It was a time of chaos, lawlessness, and social upheaval. Prints were generally published in series (sometimes taking years to complete). 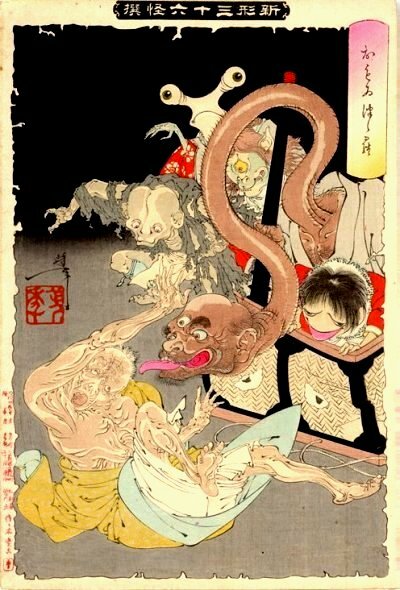 Yoshitoshi’s first great success was 28 Famous Murders (1867) which were executed during what’s called his Bloody Prints Period. They depict graphic violence and hideous death, reflecting many of the uncertainties of the time. My two favorite series, though, of his are 100 Aspects of the Moon (1885-1892) and 36 Ghosts (1889-1992). Many of the Moon prints and, obviously, all of the Ghost prints deal with fantasy themes of spirits, gods, demons, and monsters. I’m going to present three examples of the 36 Ghosts prints below. Yoshitoshi was 53 years old. An archer’s ferocious expression frightens small pox demons into fleeing. 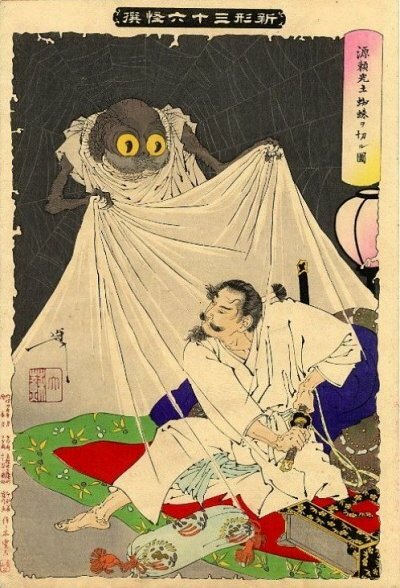 Raiko the Demon Hunter battles the giant ground spider. A greedy old woman is given a choice of two gifts. One is a small casket filled with gems. The other, which she unfortunately chooses, is a large casket filled with monsters which leap out and devour her.